Silk tree, also known as mimosa, or silky acacia, is a small to medium-sized tree that can grow up to 20-40 feet tall. The bark is light brown, nearly smooth, and generally thin with lens shaped areas along the stem. The attractive fern-like leaves of mimosa are finely divided, 5-8 inches long by about 3-4 inches wide, and alternate along the stems. Silk tree has showy and fragrant pink flowers, about 1 inche long, that resemble pom-poms and are arranged in panicles at the ends of branches. Fruits are flat, straw-colored pods about 6 inches long containing light brown oval-shaped seeds. Pods ripen in August to September and begin to disintegrate soon after, but remain on the trees into winter. Ecological Threat: Because silk tree can grow in a variety of soils, produce large seed crops, and resprout when damaged, it is a strong competitor to native trees and shrubs in open areas or forest edges. Dense stands of mimosa severely reduce the sunlight and nutrients available for other plants. Biology & Spread: Silk tree reproduces both vegetatively and by seed. Silk tree seeds have impermeable seed coats that allow them to remain dormant for many years. One study showed that 90% of the seeds were viable after five years and, for another species of mimosa, a third of its seeds germinated after 50 years in open storage. Seeds are mostly dispersed below or around the parent plant, but can be dispersed further by water. Silk trees grow rapidly under good conditions but are short-lived and have weak, brittle wood. If cut or top-killed, trees resprout quickly and sprouts can grow over three feet in a season. 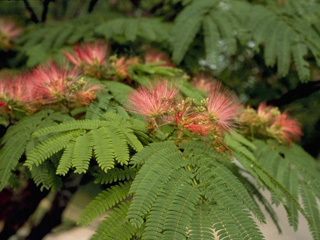 History: Silk tree was introduced to the U.S. in 1745. Silk tree continues to be a popular ornamental because of its fragrant and showy flowers. U.S. Habitat: Occurs on dry-to-wet sites and spreads along stream banks, preferring open conditions but also persisting in shade. Seldom found above 3,000 feet (900 m). Forms colonies from root sprouts and spreads by abundant animal- and water-dispersed seeds. Seeds remain viable for many years. Nitrogen fixer. Native Origin: Iran to Japan (according to Hortus 3rd. ed.). Distribution: Silk tree is naturalized from New Jersey to Louisiana and in California. Silk tree takes advantage of disturbed areas, often spreading by seed from nearby ornamentals or from contaminated fill dirt. It prefers full sun and is often seen along roadsides and open vacant lots in urban/suburban areas. Silk tree can tolerate partial shade but is seldom found in forests with full canopy cover, or at higher elevations (above 900 m or 3,000 ft), where cold hardiness is a limiting factor. It can, however, become a serious problem along riparian areas, where it becomes established along scoured shores and where its seeds are easily transported in water. Like many successful exotics, it is capable of growing in a wide range of soil conditions. Many other small to medium-sized trees make excellent alternatives including:? Other alternatives include serviceberry (Amelanchier arborea), river birch (Betula nigra), redbud (Cercis canadensis), fringetree (Chionanthus virginicus), flowering dogwood (Cornus florida), sweetgum (Liquidambar styraciflua). Mechanical: Trees can be cut at ground level with power or manual saws. Cutting is most effective when trees have begun to flower to prevent seed production. Because mimosa spreads by suckering, resprouts are common after treatment. Cutting is an initial control measure and will require either an herbicidal control or repeated cutting for resprouts. Chemical: Silk tree seedlings and small trees can be controlled by applying a 2% solution of glyphosate (e.g., Roundup) or triclopyr (e.g., Garlon) and water plus a 0.5% non-ionic surfactant to thoroughly wet all leaves. Systemic herbicides such as glyphosate and triclopyr can kill entire plants because the chemicals travel through a plant from the leaves and stems to the actively growing roots, where they prevent further cell growth. Use a low pressure and a coarse spray pattern to reduce damage from spray drift on non-target species. Use caution when applying these products, as glyphosate is a non-selective herbicide that may kill non-target plants that are only partially contacted. Triclopyr is a selective herbicide for many broadleaf plant species. Triclopyr is a selective herbicide for many broad-leaved plant species and should be considered for sites where native or other desirable grasses are meant to be conserved. Bonner, F.T., M.S. Hooda, D.P. Singh. 1992. Moisture determination on seeds of honey locust and mimosa. Tree Plant Note, USDA Forest Service 43(3):72-75. Bransby, D.I., S.E. Sladden, G.E. Aiken. 1992. Mimosa as a forage plant: a preliminary evaluation. Proceedings of the Forage Grasslands Conference. Georgetown, Texas; American Forage and Grassland Council 1:28-31. Gleason, H.A., A. Cronquist. 1991. Manual of vascular plants of northeastern United States and adjacent Canada. 2nd ed. The New York Botanical Garden, 910. Hartel, P.G., B.L. Haines. 1992. Effects of potential plant CO2 emissions of bacterial growth in the rhizosphere. Journal of Soil Biological Biochemistry and Science 24(3). Panizzi, A.R., F. Slansky, Jr. 1991. Suitability of selected legumes and the effect of nymphal and adult nutrition in the southern green stink bug (Hemiptera: Heteroptera: Pentatomidea). Journal of Econ-Entomology 84(1):103-113.